Apple released the third beta of iOS 12 for developers on Tuesday, July 3. The update comes exactly two weeks after the release of the second developer beta, which introduced a variety of fixes as well as new issues, and just one week after the release of the public beta. 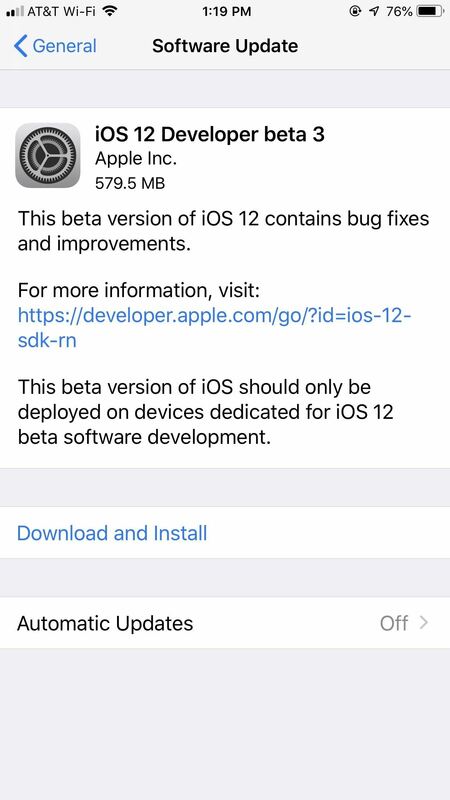 Public beta testers received this iOS 12 update on Thursday, July 5, labeled as public beta 2. Beta 3 (or 2, if you're on the public beta) appears to include many bug fixes and security patches, but most notably includes Apple's new Maps features. According to TechCrunch, the Google Maps competitor now uses data from Apple directly, rather than third-party companies. Users should expect to see better directions as well as more detailed maps, but only in San Francisco and the Bay Area to start out with, since that's where it's launching first. However, only time will tell if the features live up to Apple's expectations. If you want to update your iPhone to the third dev beta of iOS 12, or the second public beta, you need to be a registered developer or public beta tester with a valid configuration profile. If you have "Automatic Updates" enabled, you can wait for the software to update overnight. To download it right now, however, open the Settings app, select "General," then "Software Update." Then, tap "Download and Install," and follow the on-screen prompts. When Family Sharing is enabled for an iCloud account, only family members designated Parent/Guardian may disable Screen Time on their device. To enable a Restrictions Passcode on a Child device where the Child has enabled Screen Time, the Parent/Guardian must first disable Screen Time on the Child device and reenable Screen Time from the Parent/Guardian device. When 'Ask For More' is enabled on a Child device, entering the passcode on the Child device to approve more time still results in a prompt on the Parent/Guardian device. While in Day view, an event might appear on an unexpected date. (40586853) — Workaround: Switch to Week or Month view then back to Day view. Alternatively, quit and relaunch Calendar. When layers are quantized <8-bits or with a lookup-table, users may encounter issues in deconvolution and recurrent layers. (40632252) — Workaround: Use only linear 8-bit quantization on these layers. Models with flexible input sizes may unexpectedly reject an input using the default size displayed in Xcode's type field. (40632323) — Workaround: Supply a non-default size input on first prediction call. Your device might not register for iMessage and FaceTime using your phone number. (41374914) — Workaround: Restart your device. Group FaceTime calls cannot be initiated between iOS 12 beta 3 and the first iOS 12 beta release. 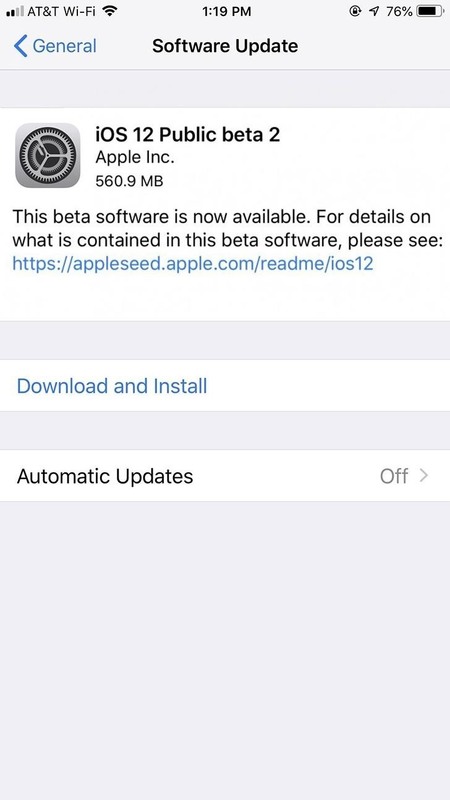 (39873802) — Workaround: Users should update to iOS 12 beta 3.
iPod touch (6th generation), iPhone 5s, iPhone 6, iPhone 6 Plus, iPad mini 2, iPad mini 3, and iPad Air support only audio (no video) during Group FaceTime calls in iOS 12 beta. Viewing Wallet passes in SFSafariViewController might be unavailable. (40415649) — Workaround: View the pass in Safari. Adding shortcuts to Siri might fail for shortcuts with images in PDF format. (40395673) — Workaround: Use another image format. Wallet might unexpectedly quit on launch. (41603255) — Workaround: Use the application switcher to quit Wallet then try launching it again. Although still in the early stages of beta, iOS 12 has earned itself a positive reputation. While it may seem odd at first glance, users overlook the short list of new features as well as the long list of bugs, mostly because of its superiority in performance when compared to iOS 11. In fact, Apple's previous effort was received poorly almost from the beginning. Users complained about the overhauled notification system but complained even louder once bugs began to wreak havoc. From auto-correct glitches to out of order iMessages, iOS 11 and bugs seemed to go hand-in-hand. Stability isn't the only thing that's new in iOS 12, however. Although Apple placed a lot of focus on the overall iOS experience, users can expect to see new Animoji for iPhone X, notification grouping, a special weather widget for the lock screen, among at least 47 other new features. Make sure to check out our guide below to see everything new in iOS 12.